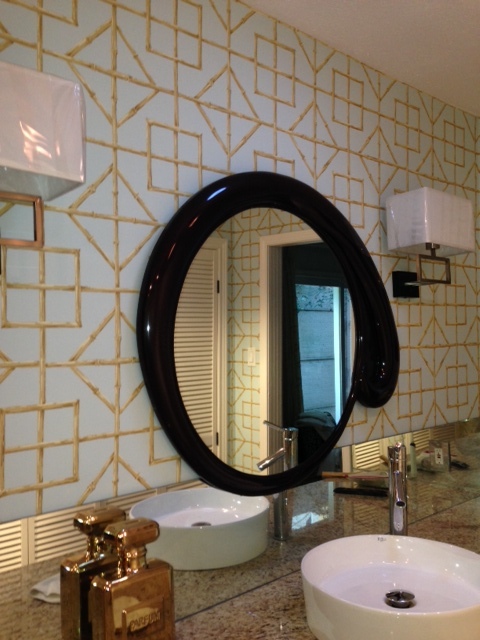 Here’s a classic trellis pattern in the master bathroom of Houston interior designer Jak Kester. The walls in these two rooms were very crooked, and I had to pull a lot of tricks out of my bag, to get the wallpaper to look straight. I’m pleased with the way it turned out, and he was ecstatic. 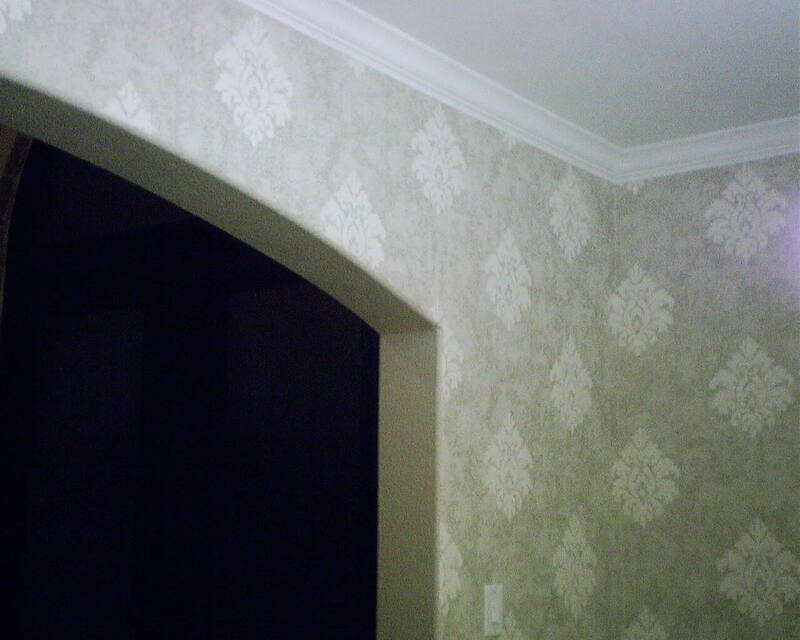 No, You Can’t Hang Wallpaper Over BRICK! No, no, no! BAD idea! 1. 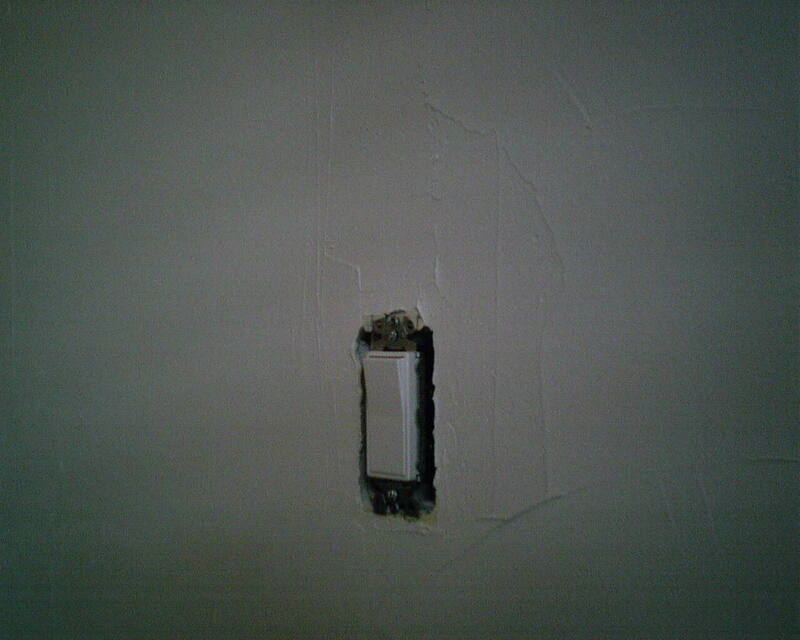 Brick is porous, and no wallpaper paste will work. 2. Brick is rough and bumpy and has grout lines, all of which will show under the paper. I suggested she attach 1″x2″ strips of wood to the top and bottom of the brick wall, and then tack or staple the grasscloth to those strips, overlapping the seams. It will look something like a curtain, or fabric wall, and will be easy to remove later, too. 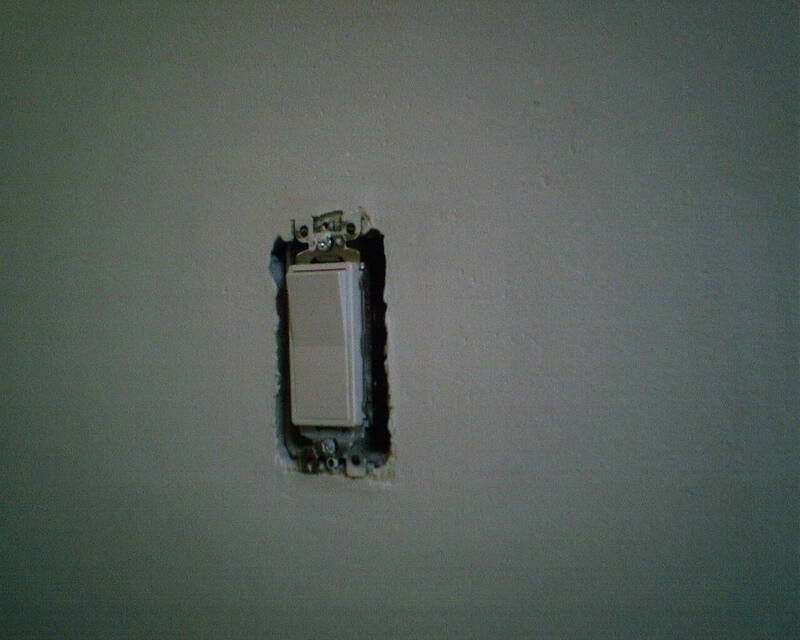 did some work in a home a month ago. They sold the house and have moved to Cambridge, U.K. She just e-mailed me asking for info on the wallpaper sample I showed her, because now she wants to use that pattern to update her home. 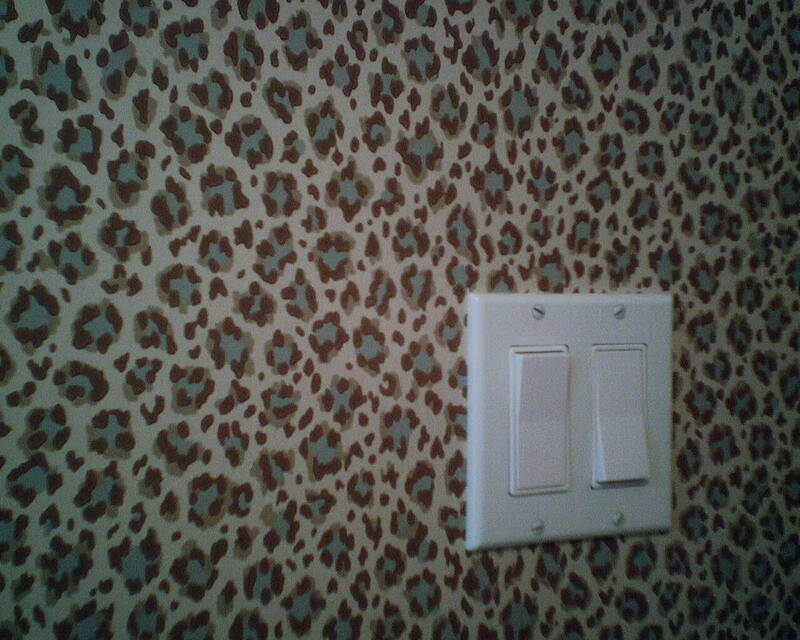 I have hung this pattern many, many times. It’s beautiful, it works in many types of spaces, it goes up nicely, and holds up well. It’s from Thibaut’s Historic Homes VII line, and is called Augustine. Here’s a cool little trick. If I am hanging wallpaper that is going to abut a mirror, it’s fun to plot the layout so that HALF the design ends at the mirror. The fun part is that the mirror reflects the other half of the design, and it looks like it continues on uninterrupted into the mirror. 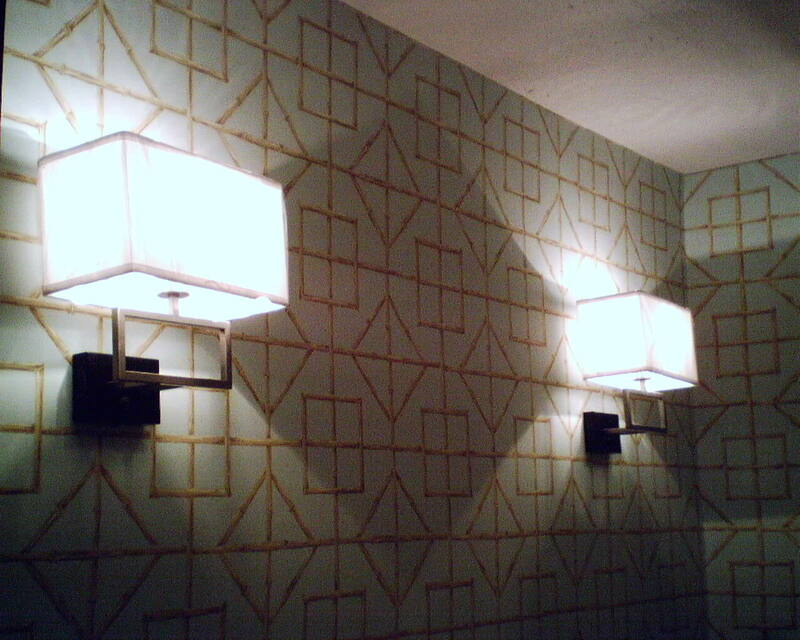 This fun geometric design is by Antonia Vella for York Wallcoverings, and was hung in a powder room in the Montrose neighborhood. These bull-nosed (rounded) corners and arches have been an architectural feature in new homes for several years now. Let me tell you – they are a pain in the behootus if you are trimming wallpaper around them. With a straight corner, you have something to brace your razor blade against, and can easily get a neat, accurate cut. But these rounded babies, especially when compounded by the extra thick texture that is fashionable in certain new homes today, are very difficult to trim, because you can’t see or feel where to put your razor blade. Add to that walls that are out of plumb, and you’ve got a 30-second cut that’s gonna take you 4 minutes. A Facebook paperhanger friend of mine invented a little gadget that helps immensely when cutting along these edges. As you can see, it works pretty darned well. 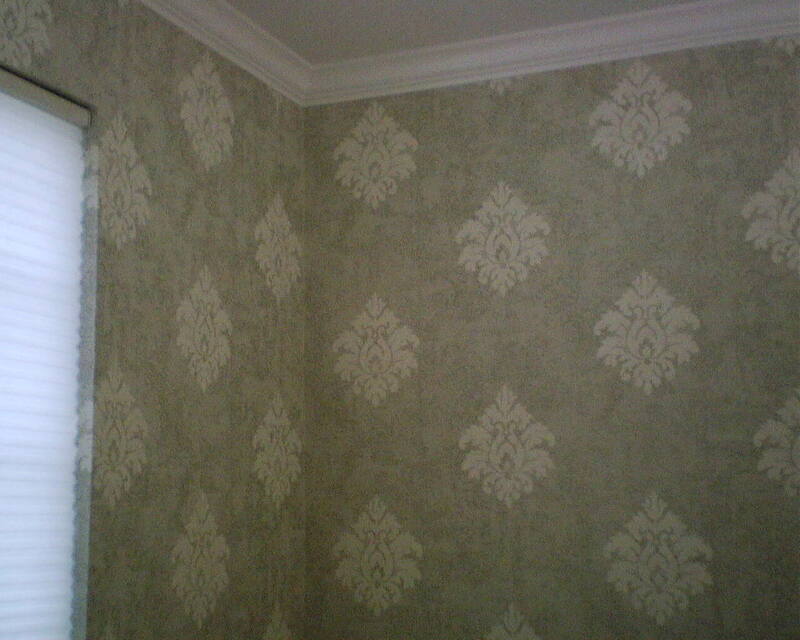 This wallpaper pattern is by Designer Wallpaper, by Seabrook, pattern # JV 80107. I hung this paper in a dining room of a young family in a new development in Katy, Texas. Nicely Packaged Wallpaper – For a Change! What a surprise! 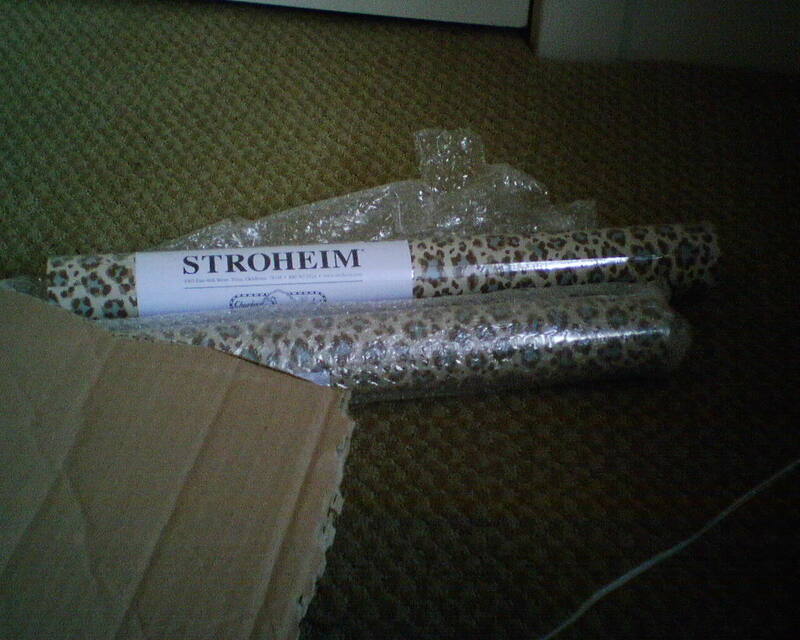 The camouflage wallpaper for the baby’s nursery I am doing this week came packaged very nicely. 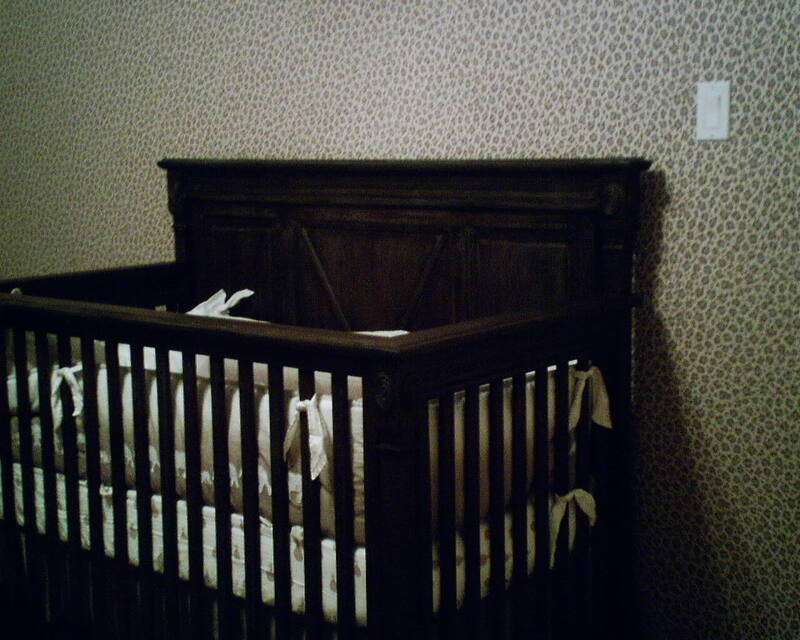 Note the bubble wrap around the individual rolls AND around the ends of the wallpaper. In addition, it was all packed into a sturdy cardboard box. Horrhaaay! Finally a manufacturer took the steps to protect his merchandise. 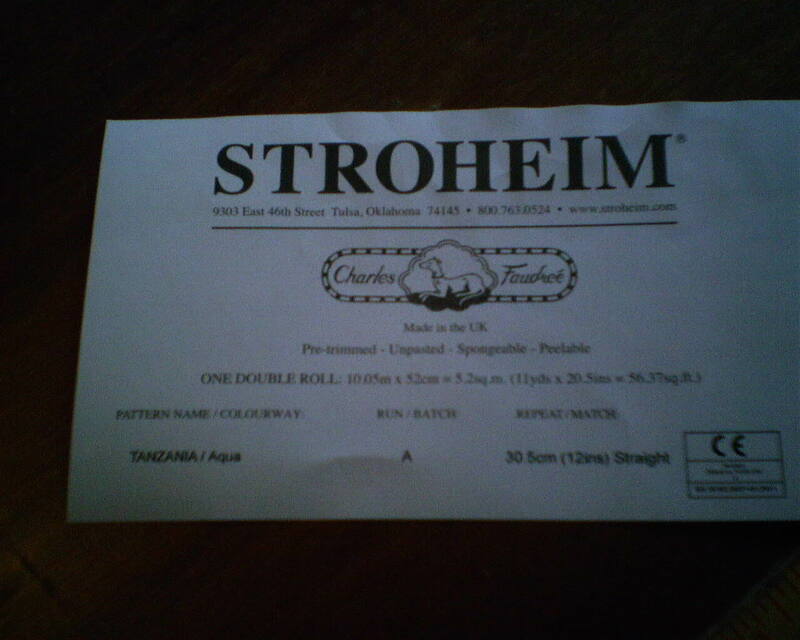 The paper came all the way from England, and arrived in perfect condition. 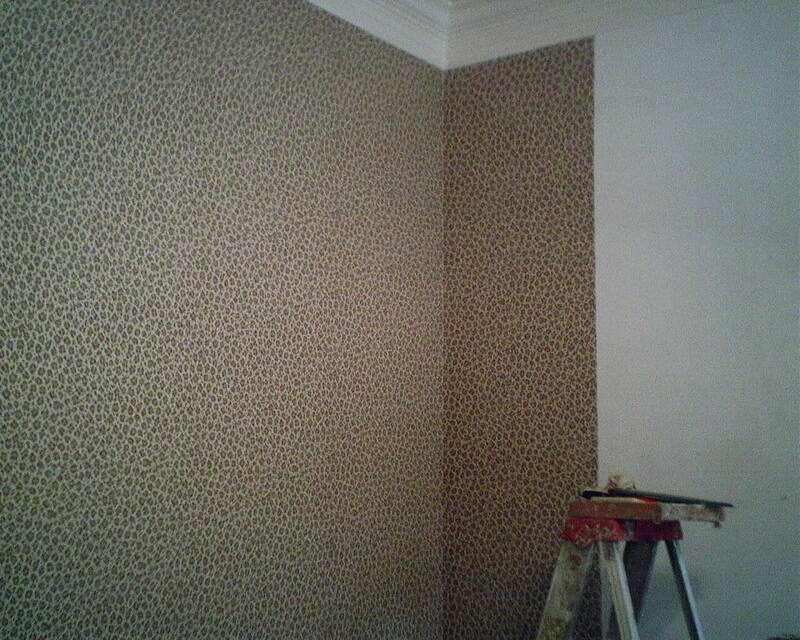 I’m hanging lots of accent walls these days, but this expectant mother wanted all the walls papered, floor to ceiling. Up close, it looks a little busy. But once the furniture goes back into the room, and pictures and other things go up, the walls tend to recede, and the pattern becomes simply a backdrop – a very adorable backdrop – for the furnishings in the room. 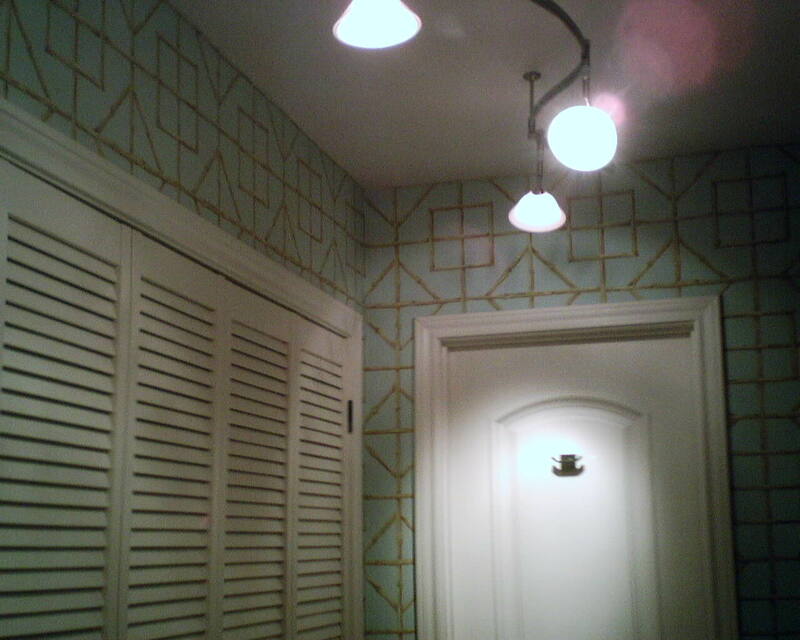 This wallpaper is made in England, what we call a “pulp” material, by Stroheim, pattern “Tanzania,” color aqua. The baby’s nursery I am papering this week started with fairly heavily textured walls. (I didn’t get a pic of the texture.) If left on the wall, this texture will show through the new wallpaper, and it will also interfere with adhesion of the new paper. The first day, I skim-floated the walls (troweled on joint compound). Because the texture was so thick, it was not possible to get anything approaching a smooth job, as you can see in the first photo. The second day, I sanded the walls smooth, vacuumed, wiped the walls with a damp sponge, and then primed. 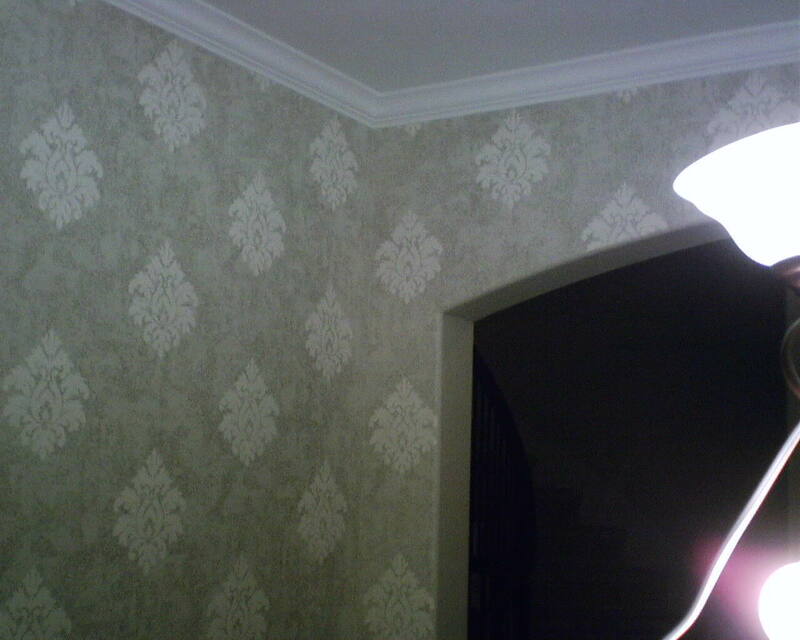 In the second photo, you can see how nice and smooth and ready for wallpaper the walls are. Look closely – VERY closely (or perhaps, a quick look will show it better), and you will see that every seam is noticeable. It took me a long time to figure out what was wrong. I knew I had matched the pattern correctly. The medallion is at the top of the wall on every strip, as it should be. What I finally figured out is that the background design, the mottled mini-print, did not correspond with the medallion. If I matched the mottly print, then the medallions would not line up properly at the top of the wall. And when I put the medallions at the top of the wall, then the background design did not match. The background had been printed out of sync with the main design element. Maybe the manufacturer thought the mottled background was indistinct enough that it didn’t need to be matched. I beg to differ – I think it’s quite noticeable. 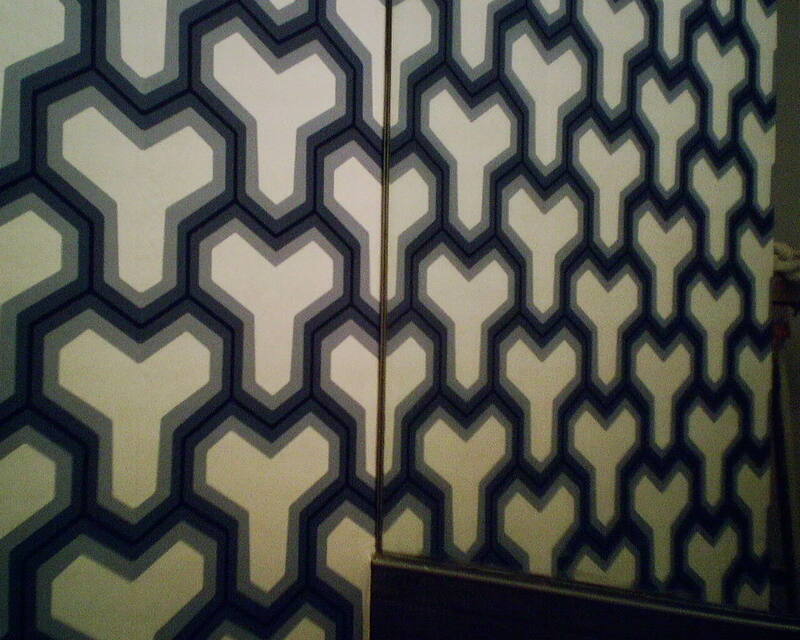 However, the homeowners didn’t notice a thing, and totally loved the wallpaper in their new dining room. 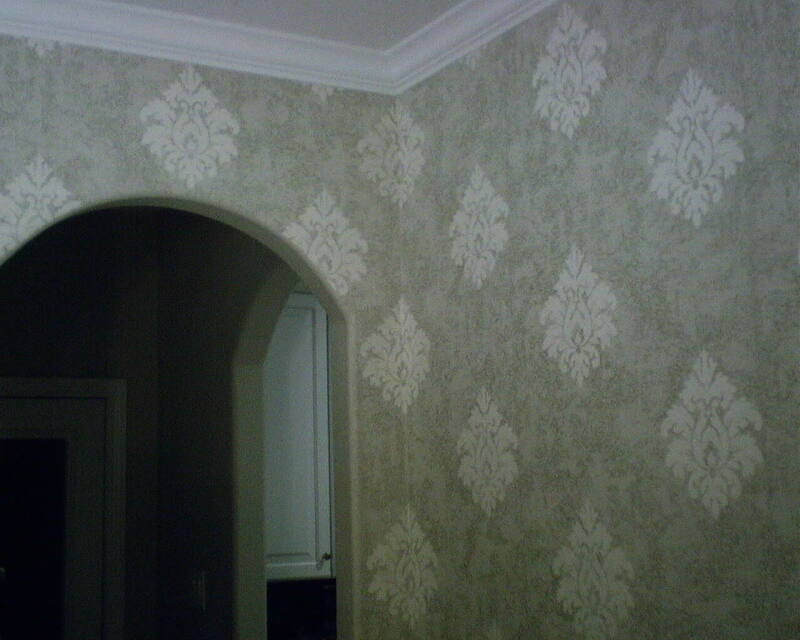 The brand is Designer Wallpaer, by Seabrook, Pattern # JV 80107. You are currently browsing the Wallpaperlady's Blog blog archives for December, 2013.